We bought a used 2016 500 Auto 4x4 this spring with 514 mi on it and my wife has been driving it since, no craziness, very little mud. We were out on the weekend and all of sudden it just revved up slowed down and stopped. I had a look to see if something simple was wrong, found nothing, and towed it back to the garage. Took the belt cover off this evening and found the belt shredded into pieces and some of the remaining cords wrapped around the drive sheave. see pics. What would I look for as the cause so I can prevent it from happening again? Last edited by jaydeesee; 08-03-2018 at 07:40 AM. But you said a key word, "used". You don't know what the machine had been thru before you got it so the belt could have been abused. Regardless, without a history of the prior owners riding habits and an inspection of the belt prior to you starting to ride it, a cause cant be determined. Just clean up all the mess you describe. 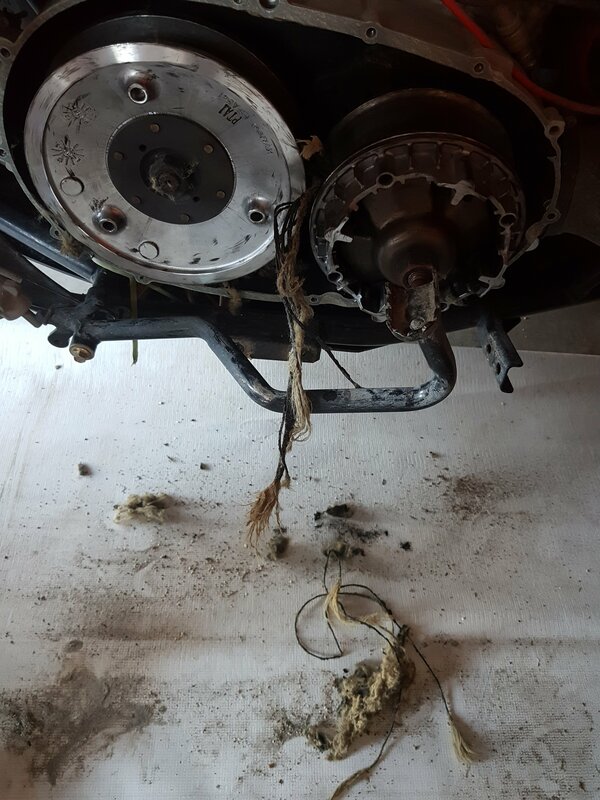 Use scotchbrite pads and a bit of brake cleaner to clean up the sheave faces after you've gotten all the belt pieces out making sure you get all the nooks and crannies clean too, and replace the belt with a OEM belt. 660catman, jaydeesee and T.Ray like this. 2013 550 Core, AC Hand Guards, Zilla 27's, RTR Steer Light & Shock Bushings, Auto Resetting Brkrs, Fnt & Rr Brush/Bumpers, RAM X Mnt & Cup Hldr, Champion 3klbs Winch, AmSteel 3.5Klbs Syn Rope, Braided Hook Strap, Rowe Anodized Billet Alum Fairlead, Bostitch 28" wtrprf box, Reese Tow Hook, DYI Web Catchers, Koplin Overfenders, SpeedWerx Clutch Kit, DDM HID 35w 8K Kit, CREE LED light bar, green LED low beams and green Oznium 3W LED bullet running lights. 2" Moose Lift. Last edited by AlexG. ; 08-02-2018 at 07:41 AM. Thanks muchly! I will do exactly that. When you are driving slow, hauling a trailer or plowing snow, always use Low range. 1 feature that my Arctic Cat 700 Diesel has= a blower that forces a lot of cooling air thru the CVT. If I wasn't so lazy, I would put a blower on my 700 TRV. Like Alex G said, previous owner could have abused it or lugged it hard in High range. jaydeesee and T.Ray like this. So, I cleaned the sheaves up with scotch brite & brake cleaner and replaced the belt with an OEM following the service manual procedure, fired it up and all seemed to run fine. I took it for a small spin and it did seem to work fine, although it did seem like maybe it was pulling harder than it should, but never having ridden it much, I passed it off as normal. My wife did a few short rides over the next two days, keeping in mind the recommended break in. She has always complained that the CVT area is much hotter than her old 2004, but I thought maybe that was just a Kymco thing. Anyway, I was out mowing the trail with the 2007 and mower while she would follow me for a bit and then read for a bit, then catch up and read again. We did this for several hours and finally I was ready to quit for the day so shut the mower off and towed it about 11 miles running between 23 and 30 mph with her following me. Dropped the mower off and we headed for home on the trail running at about 35 mph. We had only gone about 3 miles when her machine stopped with a bunch of smoke near the CVT and very hot in that area. I towed it back home and opened up the CVT today to find the belt burnt and shredded to bits. This time however even the nylon rollers inside are melted on one side and will need to be replaced. Any thoughts on what is causing this? This belt lasted about 22 miles and was not abused what so ever! You need to check the cvt air intake and exhaust to ensure they are clear of obstructions. Use your shop vac with the hose hooked up to the blow side and place the hose at each of the vents to make sure they are flowing air. When she was stopped and reading did she keep the machine running/idling and in neutral? Or did she shut it off. One thing to keep in mind is that when the machine is in neutral (or in gear for that matter) and idling, there is no air flow being generated thru the clutch by the primary sheave acting as the fan. Because of the wetclutch, the primary doesn't move unless it's over engagement rpm. So instead of dissipating any heat, it just sits there and builds, slowly yes, but builds nevertheless. 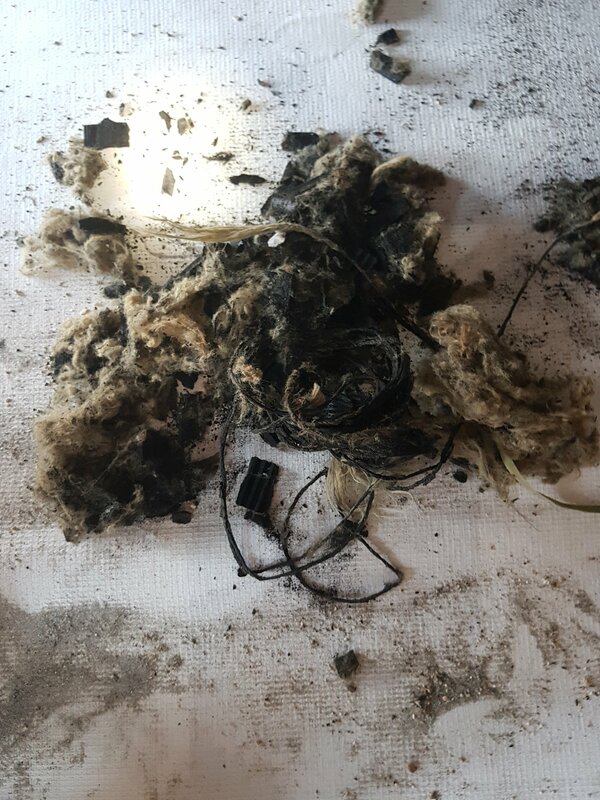 I'm not sure that the roller covers are nylon or Teflon, but regardless you will need to replace the melted ones along with the dampers that look like they've disappeared as well. 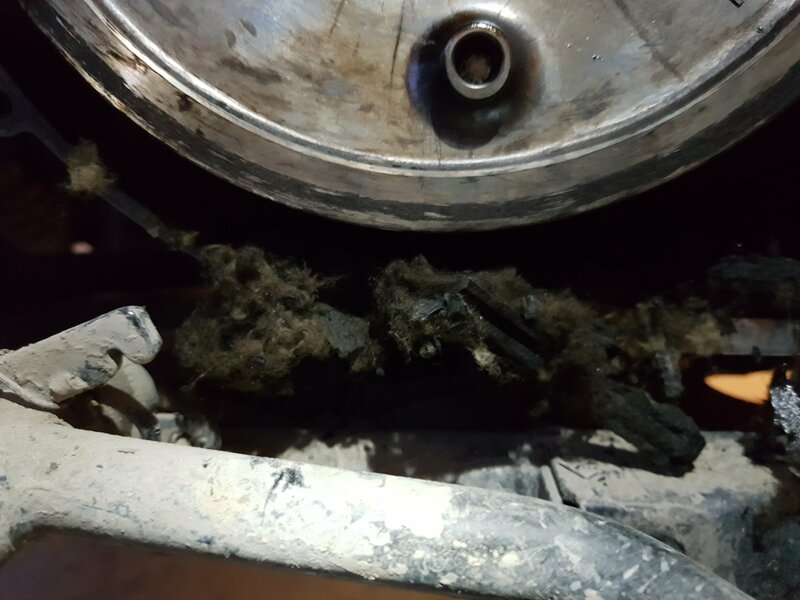 It's very difficult to diagnose what the real issue is... it's obviously heat, because just blowing a belt will not melt the roller covers and the dampers. Many here have added snorkles to improve the air flow to both the engine and the cvt to improve cooling. Some have also added the blower fan that the diesels have to make sure that air is flowing. But regardless of what others have done, YOUR machine has a cvt cooling problem that needs attention. Thanks for info, Alex. She did shut it off, I am quite sure, because the lights went off when she stopped,and she always turns the lights on when she is running. I had decided that I would check out the cvt intake and exhaust on the weekend, while I am waiting for the parts, but it sure seems to me there must be something else generating heat. Not sure if that model has a bearing in the clutch cover, but if it does, take a look at it. years ago i had a 500 that a seal went bad behind the drive clutch. Oil on the belt and it blew the belt. You might have a bearing going south to create that much heat. AlexG. and jaydeesee like this. Yes, it does have a bearing in the CVT cover and I will check it out. thanks for the tip! 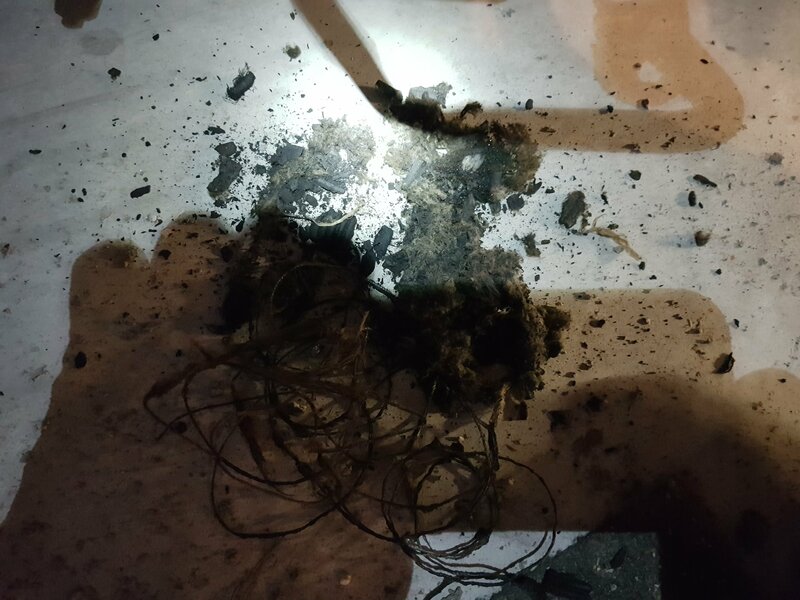 Yes, my exhaust outlet was full of shredded belt, so that explains why the belt burnt up the second time. 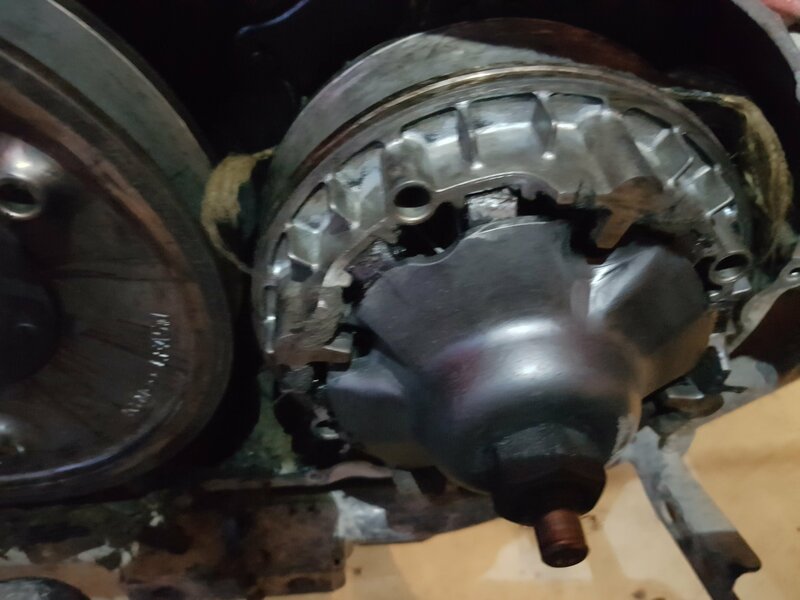 Now I see that the driven clutch rollers are also melted flat on one side. Arctic Cat doesn't offer those as repair parts but a bit of research points me to the Kymco MXU-450i clutch. Can anyone confirm this?